Global Fabrics and Interiors is now an official drop off point for the incredible @67 Blankets for Nelson Mandela Day initiative. 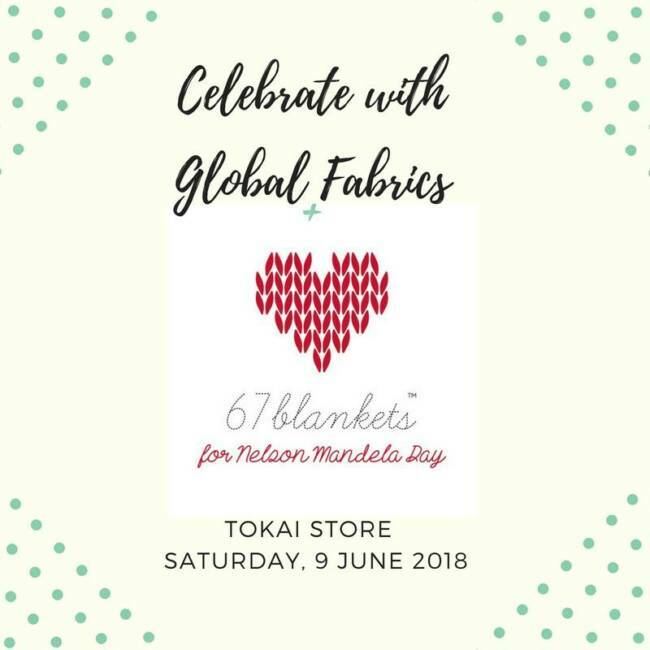 JOIN US FOR THE GLOBAL FABRICS ’67 BLANKETS FOR NELSON MANDELA DAY’ CELEBRATION EVENT! Visit the store to take advantage of our exciting wool specials! Customers are invited to join our knitting circle and social! about the initiative and how they can get involved. Beginner’s knitting instruction – we’ll have someone on hand to teach you some basic knitting strokes. – Selected ranges of wool will be discounted by on the morning of the event. – Charity and Snowball wool will sell for R20 a ball. – 67 Blankets ‘Starter Kits’ will be on sale for R35 on the morning. These will include a pair of knitting needles, a ball of wool and instructions for knitting a blanket square. – Anyone who attends the event between 8:30am and 1pm will go into a lucky draw and stand a chance to win a R500 Global Fabrics wool voucher! – Anyone who knits a 20cm x 20cm square for the 67 Blankets initiative on the morning of the event, or who drops one off in the designated ‘67 Blankets collection bin’ at the store on the morning of the event will be entered into the same lucky draw. – Meet new people! Knit with friends! – Tea and coffee will be on offer. For more information, please email: info@globalfabrics.co.za.